An unique and innovative serum that treat signs of skin aging, wrinkles, dryness, skin laxity and loss of moisture and volume. Hyaluronic acid provides to facial skin volume and smooth texture. Daily use of serum and facial cream containing hyaluronic acid provides a particularly effective result. 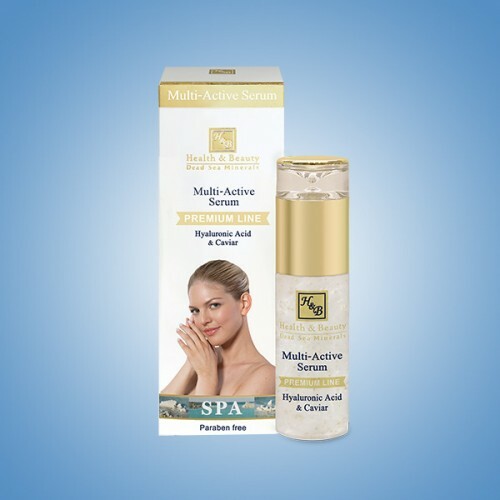 The serum is enriched with caviar extract that increases antioxidant activity and helps slowing signs of skin aging. The serum is based on ingredients which promote anti-aging activity such as Rose Hip oil, Collagen and Elastin to improve elasticity, Omega 3+6, Vitamin E, Aloe Vera, Chamomile and Dead Sea Minerals. Use daily, before moisturizing cream. Recommended for use by women over age 25.